Mother Sarah Hawkins was born September 25, 1935 to the late Letonia Hawkins in Telfair County, Georgia. Heaven was surely in need of angel as they sent for her in the wee hours of the morning of April 9, 2019. “Miss Sarah” as she was so affectionately called by many, called Lumber City home for a great deal of her life. She was educated in the public school system of Telfair County and even played basketball during her high school days! Sarah was a homemaker for many years before deciding to become a visiting nurse, as she loved taking care of others. Many who knew her as teen would often speak about her love for fashion and her flair for hair. Fishing was something that she and Helen loved to do many years ago and also traveling together to visit her grandchildren. 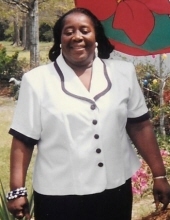 She journeyed to Decatur, Georgia for few years to pursue other goals and to be near her daughter and granddaughters while they attended school. She worked in many restaurants as a baker and also for AMVETS where she dedicated her time and talents to helping all those who knew her. Mother Sarah also loved her church home, Saint James C.M.E. She loved ushering and attending services until her health began to fail. She is survived by her only daughter, Janie L. Williams (Jack Williams, Jr.). Janie was entirely devoted to the care of her mother until the very end. She also leaves to cherish her memories, the apples of her eye, two granddaughters, Retonia Michelle Clements of Conyers, GA and Jackqueline Williams-Rumph (Jimille) of Fort Valley, GA. Anyone who knew Sarah, knew how special Michelle and Jacki were in her eyes. She was every bit the doting grandmother. Also loved immensely by Sarah, her three great-grandchildren, Darryl Dixon, II, David JamesWilliams, and Devin Mykel Williams. If love alone could have kept her, never would she have died. Along with her family, there are many special family and friends who aided in the care of Miss Sarah and will also miss her terribly. Mrs. Helen Clements of Lumber City, GA, Linda and Harvey Smith of Hazelhurst, GA, Celestine Kellem, of Atlanta, GA and Margret Clinch of Kennesaw, GA, all devoted cousins, and Elijah and Veronica Towns, Lumber City, GA, very dear neighbors, who were always a phone call away, and Councilwoman Alice Strong. She is preceded in death by her parents and a special niece, Teshia Tobler of Lumber City, GA. The family of the late Sarah Ann Hawkins would like to express our deepest gratitude for your thoughts, prayers, calls and any acts of kindness you shown or shared during this period of bereavement. To send flowers or a remembrance gift to the family of Sarah Hawkins, please visit our Tribute Store. "Email Address" would like to share the life celebration of Sarah Hawkins. Click on the "link" to go to share a favorite memory or leave a condolence message for the family.